A beautiful social hall for Weddings, Bar and Bat Mitzvahs, brissim, banquets, meeting rooms for 50 to 400 people, a large kosher kitchen on the premises, and many RCC (Rabbinical Council of California) caterers to choose from. Included in the amenities is a large Beis Midrash, perfect for a Hasan's Tish, 400 person capacity sanctuary with a magnificent wood carved Bima and skylight, which can be opened for wedding ceremonies. Get more for your wedding! 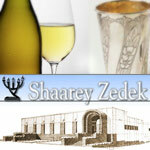 Don't forget to mention ChossonKallah.com when visiting Shaarey Tzedek.